Flush - The Chip's Challenge Wiki - The Chip's Challenge Database that anyone can edit! Flush is the 141st level in Chip's Challenge Level Pack 1. It was created by Archie Pusaka. Begin by collecting all of the chips. Move down into the room with the chips and the red keys. As you do this, Chip will have to push a block onto the switch that starts the balls replicating. Be sure to collect only the chips at this point. Do not collect even one red key. Move quickly and then dodge back out between the balls before the column fills up and blocks Chip's path. Now move up and across the force floor. When Chip hits the end of the line (a red lock), he will be blocked and can move upward. Go up and through the gate to collect the suction boots. Go back out to where the balls are and down the far left force floor and stand on the button to release the balls and clear the blocked column. Then go back up into the room with the red keys. Chip only needs one at this point, but still can collect a few without danger. Now slip back out between the pink balls and back to the red gate with the glider. Open the gate and collect the flippers, then exit the room. Go back out toward the water where the tanks are and swim up to collect the fire boots. Now go back down and stand on the button again to release the balls. 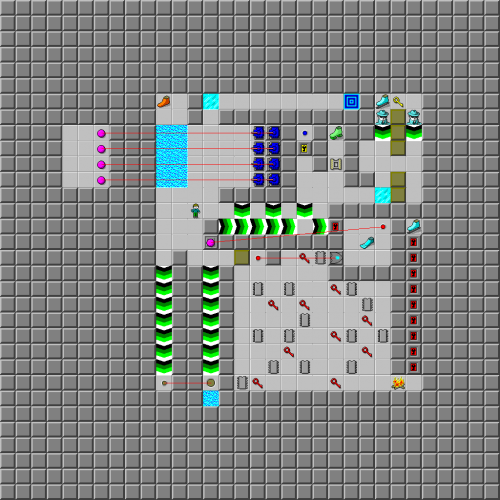 Collect the remaining red keys, clear the ball column again, and then go back through the fire, unlocking the red locks and collecting the ice boots. Move quickly so that Chip are not blocked by the pink balls. Return to the room with the blocks. Push them out one by one to block the force floor. The thief will steal your suction boots as you collect the last block. At that point, pick up the other pair of ice boots and the yellow key. Be careful not to lose the boots as Chip brings out the final block. Open the yellow lock to press the blue button and stop the tanks. Move the final block into position on the force floor so that Chip can escape. Move up into the room where the tanks are. Go past the ice and down the hall to the exit. This page was last edited on 26 February 2019, at 04:21.